To we gardeners, cats can be the bane of our existence. I can't tell you how many times I have gone out to weed only to find the occasional gooey lump of cat poo buried in the soil. Every time I weed a patch of soil and admire it's lovely soilness, the cats line up like kids at Disney Land just waiting to spoil the soil. They, in their feline hegemony, believe that you're cleaning out the soil for them; like your future cabbage patch is some giant outdoor cat box. 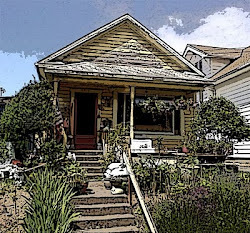 Of course, this issue around garden indiscretions is self-inflicted having adopted 9 of the little darlings (or rather having 9 adopt us as most materialized due to evil human kitten bearers thrust them in our faces proclaiming that they would rather have our house wrecked than theirs). It's the same mentality as a friend of mine having a cat live among the thousands of skeins of yarn in her yarn store. I just chalk it all up to being a certain personality type that gravitates towards a certain lifestyle that tends to incorporate potentially incompatible elements into the mix. For gardeners, it's often animals that use the great outdoors, preferably the unprotected garden spaces, to do their business. We're suckers for a cute face. It's that nurturing thing coming out. I have listened to a many a gardener protest to me that the neighbor's cat chooses their yard above all others. It may be that their yard hasn't been claimed by a feline resident already, so it's open season for territory. It could be that all that lovely exposed soil, especially out of season is just too tempting for any feline to resist, especially after it's been cultivated to a lovely, fluffy consistency with fresh compost. Let's face it, well kept gardens are cat magnets. We're out there with the pooper scooper but, unfortunately, cats hide it all. Best to be proactive, I think. Well, I've seen a variety of creative solutions to keep cats out of the beds. One solution is the motion sensor sprinkler head. It's automatic squirt bottle. When the cat gets too close it gets hosed. It sounds like a great solution until you forget to turn it off before working in that area. Plus, I would think you need a whole irrigation system installed for this purpose if your garden is big enough. Maybe just a heat seeking sprinkler head will do. Another solution is laying chicken wire just under the top layer of soil. Awkward! Need I say more? 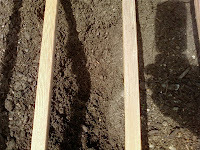 A thirds solution involves sticking a lot of small stakes into the soil. I suppose you could use garden art stakes if you don't like that rustic look, but you need a lot of them close together to discourage the potty behavior. Creativity can be expensive. Having to deal with cats around our garden, we've come up with a great solution, at least for the veg. beds. 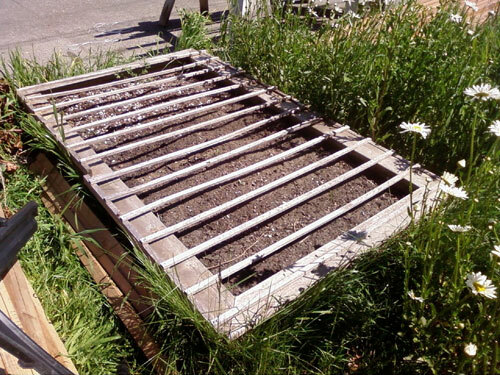 Roland built a wooden grid system for each raised bed and the claw foot tubs. The slats are on 4 inch centers, attached to a frame that fits over the bed. Not only does it discourage cats, the grids act as row guides. Each 8 foot long bed has 3 removable sections. The only draw back is the inability to easily remove them if you have large crops such as cabbages, growing through the slats. Other than that, this system is almost 100% cat proof. 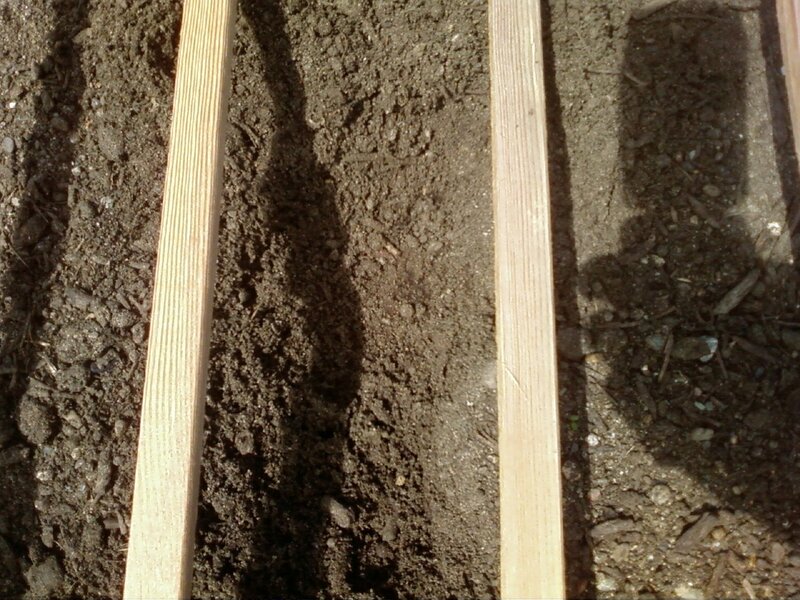 As for the open garden spaces for larger crop plants, we most often use the stake method until the vegetation is well establish. By mid summer, our garden is pretty packed with plants, at which time our cats move on to the neighbor's yard.